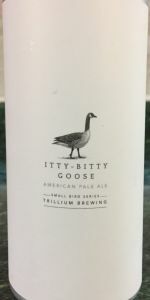 A refreshingly hoppy American pale ale, Itty Bitty Goose is another edition in our "Small Bird Series" of lower ABV pale ales. The nose is an ripe apricot, lemon, and lightly toasted malt. Citrus peel and grassy hop flavors fill the palate and ends in a soft yet crisp mouthfeel. Dry and effervescent, light to medium bodied. Thanks to JLindros for sharing. A - Poured into a Kate the Great tulip a nice hazy light orange hue with a thin white head that fades to leave light wisps. S - Aromas of light stone fruit, faint dank hops, very light citrus. T - Taste is similar to the nose. There is huge cracked wheat thing going on just destroys the hops. Hops which are lightly citrus. M - Mouthfeel is lightly carbonated. O - Overall this was a rather messy beer, huge wheat ruined the beer. Poured into a tulip, freshly canned today. Looks decent, the head dissipates a little quickly. Orangey-yellow and cloudy. Not a ton to smell, more malt than allot of other trilliums, Just an okay mouthfeel. A little pepper lemon and apricot, then malt, then hops. Overall, good to very good, a little different than the usual Trillium offerings a nice change. The beer pours a slight decent foamywhite head that dissipates quickly. The beer itself is hazy and orange. The beer smell has strong orange and floral hop notes with a hint of oatmeal sweetness that reminds me a bit of raspberries when combined with the rye notes. The beer itself has strong orange and floral hop notes with a raspberry sweet aftertaste from the oatmeal and rye. The rye is fairly subtle and acts more to work with the oatmeal than anything else. The mouthfeel is lightly carbonated and smooth with a light body but on the heavy side. Overall, a pretty good and unique pale ale that hits the spot on a warm night. 64 oz growler was poured into a pint glass. Appearance: A one finger head was poured that reduced to a thin layer. It is a yellow orange with no clarity, but vision of bubbles coming up through the glass. Smell: Citrus, some lemon, grassy, and herbal hops followed by biscuity, wheaty, bready, toasted, chewy, pale, and caramel malts. Taste: Nice and subtle hop flavor followed by toasted, pale, and chewy chewy malts. Light bitterness in the rear too. Mouthfeel: Light, crisp, refreshing, a tad chewy, light bitterness, and medium carbonation. Overall: Another solid offering from the little bird series. While I have liked others more, this one is still a little tasty treat. Earthy, slightly rotten. Worse of this set.